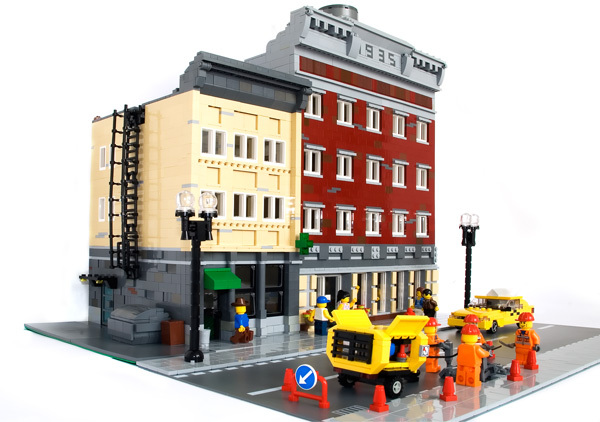 Brick Town Talk: A Trip to the Downtown - LEGO Town, Architecture, Building Tips, Inspiration Ideas, and more! The look of this little street section is just fantastic. The designs are nice and simple, and I really like the colors as well, especially with that fire escape there on the side of the tan building. It has a awesome "downtown" feeling to the whole thing, so check it out! I think you'll like it! Very nice. Are those rubber tubes being used for the water tower fence and fire escape? They sure look like it. Great idea.